While capturing screengrabs for our tutorial on creating panoramas from Google Earth we got thinking that you could use the Earth itself as a panoramic image viewer. 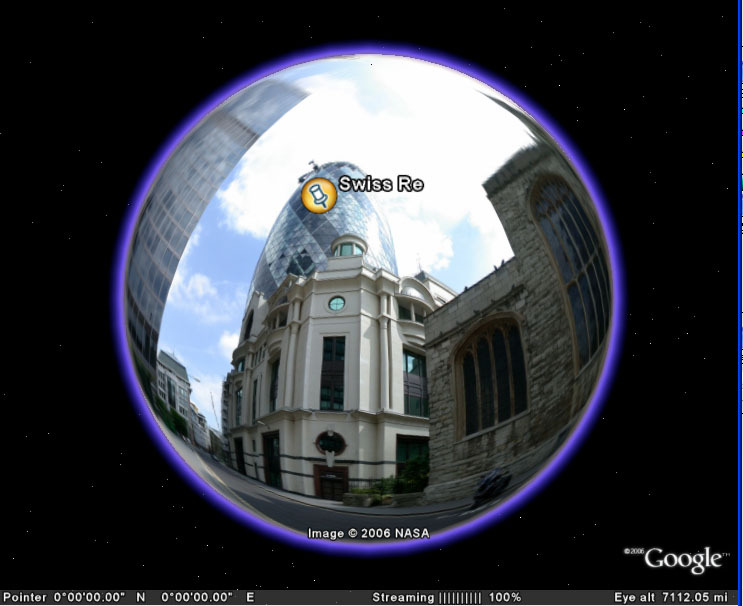 All of our panoramas on the blog cover a 360×180 degree field of view – ie a sphere. By adding a new Google Earth overlay you can load a panoramic image and wrap it around the globe, thus allowing you to use the Earth as a viewer. As its Google Earth you can then add placemarks to navigate to buildings of interest, in our case the Swiss Re and Lloyds buildings in the City of London. Thoughts or comments are as ever welcome. Please check your link to the kmz file, otherwise, very cool.